Give me the opportunity and a pasta dish will be on my side of the dinner table. This version is so simple and so delicious that if it weren’t for the carbs and calories, it would be my staple. Under the circumstances, it is an occasional treat and something to always look forward to savoring. 1. Bring 3 to 4 quarts of water & 1 TB of Salt to a rapid boil in a large pot. Add the pasta . Boil for the recommended length of time on the package, usually 8 minutes to al dente. When the pasta is cooked, drain it. 2. Heat the EVOO in a large skillet over medium-low. When the oil is hot, add the sliced Garlic & stir frequently. 3. Cook for about 2 minutes or until the Garlic turns slightly golden. Remove the Garlic from the pan with a slotted spoon. 4. 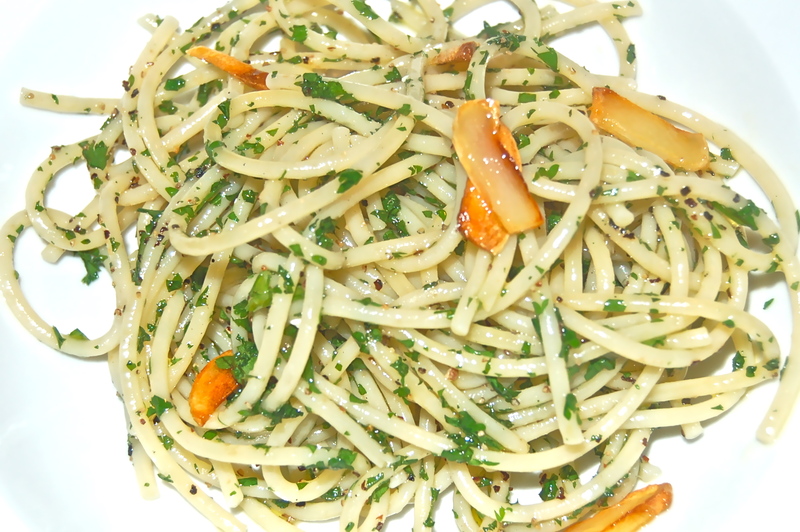 Add the pasta to the skillet & sprinkle in the Parsley, Pepper & Salt Toss the pasta to combine. 5 Garnish with the Garlic slices (optional) & to stay hot, serve immediately.